The 2012 season continues to be one of many surprises. Not long ago, Peyton Manning was being courted hard by the Denver Broncos and ultimately decided they’d be the best fit. A few games in and the broncos already decided to abandon ship and trade him to the 49ers for Colin Kaepernick, a 2013 1st round pick, and LaMichael James. Now we have another which may be even more surprising. Matthew Stafford, who had been benched in favor of Josh Johnson in Detroit, has been traded to the Eagles along with wide out Titus Young in exchange for fellow wideouts Jeremy Maclin, Damaris Johnson, and a 2013 3rd Round Pick. Matthew Stafford is still a little in shock. “You’d think putting up 5,000 yards and carrying a team to the playoffs would be enough…but whatever. They’ll regret this.” The Lions beg otherwise as they progress full steam ahead with their faith in Josh Johnson. The question immediately asked by all was how would incumbent starting quarterback Michael Vick feel about this? “I guess my time here is done. I gotta thank Philadelphia for giving me a second chance, but I am not a backup”. 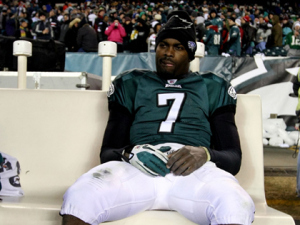 said Vick in an interview after an Eagles practice upon hearing of the Stafford trade. Vick is right though. With a top 6 quarterback rating in the league at the time of trade, he definitely is not someone who should be warming any teams bench. Although, thats exactly what he did for one week with the eagles vs the steelers. It didn’t last long though, as the Seahawks immediately inquired on Vick’s availability. 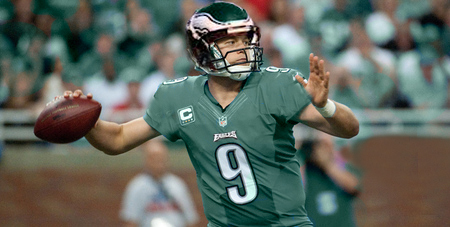 The Eagles were still reluctant to trade Vick due to Stafford’s injury history, but the Seahawks surprisingly met the Eagles very high demands. Vick was immediately shipped to Seattle for phenom Earl Thomas, the athletic and young Bobby Wagner, and a 1st Round Pick no less. The Seahawks hold no remorse though believing that Vick is the key to them getting to the next step. “See you in the playoffs.” exchanged the two coaches through email. Time will tell who gets the better of both these deals, but for now all we can tell you, is the 2012 season is quite out of the ordinary.